The Friday night Costume Extravaganza at THE NORTHLANDS EXPO (moved from SHAW CENTER as it is FLOODED) HALL D 7515 118 AVE. 7:30 PM. kicks off the celebration! Food and fun as costumes are paraded and judged. Door opens at 7:00 p.m. ; shows start at 7:30 p.m.
Not an official Cariwest event, but definitely one to check out! One of the hottest DJ from Ontario invades Edmonton. PARADE! Music! Costumes! People! Fun! 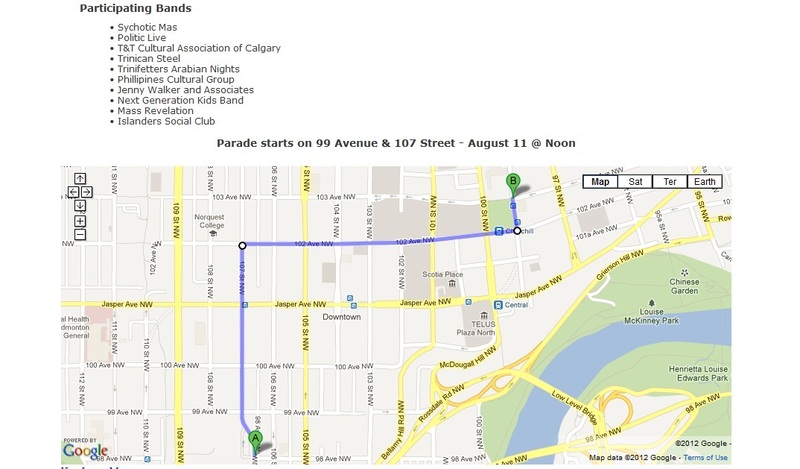 as the annual Cariwest parade winds its way through downtown Edmonton! Start noon! August 11, 2012 starts at 8:00 p.m. Apparently it wasn't complete! Calypso Rose was also in Edmonton on Friday, although for "Folk Fest"